As a quick and simple decoration to adorn your cupcakes and cakes, sugarpaste bows are infinitely satisfying to make! This method teaches you how to make bows armed with no specialist equipment so this is a perfect way to get started in the wonderful art of sugarcraft. If you fancy super-sizing these sugarpaste bows to tie up a full-sized cake, follow the method step by step but use a standard 30cm ruler as a width measurement (3-4cm width is perfect for the strips required for large bows). decorator’s trick – the wheel can cut the icing smoothly, without pulling or dragging the edges like a knife. Aim for the strips to be around 1cm wide as this is easiest to work with. Cut two 5cm pieces from one of the strips. Cut the bottom ends into points and lay the top ends on top of one another to create the tails of your bow. To neaten this up, you can cut away the top end of the tail that is lying underneath at the point where the other tail crosses over. Lay the tail in position on top of your cake or cupcake. Cut another strip to around 15cm and lay this on its thin edge. Bring both ends into the centre. You may need to dab a little water on top of this centre join with a paintbrush if your fondant feels a little dry. Take a smaller strip of fondant and lay this over the join. This will form the centre of the bow. Cut away any excess from the back of the bow. A trick is always to work front to back, which ensures that the perfect side is always front-facing and any nips and tucks are hidden. Create movement in the bow by pressing on the centre and pushing in the ribbon loops. Place this on top of the ribbon tails on your cake and there you have it, a totally edible bow! 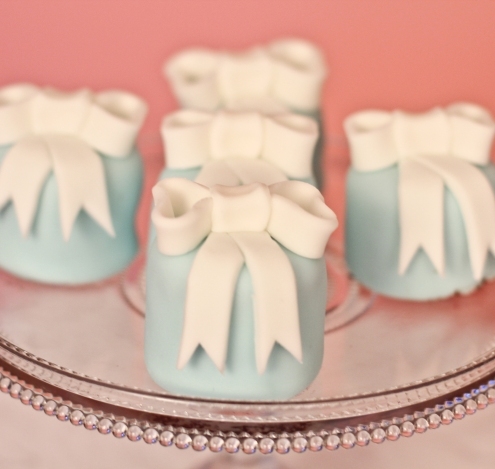 You can amend the sizing of the pieces to create bows of any size to fit your cake. With this quick method, you will likely find that your bows are not 100% identical; if you want to achieve uniformity, you will need to invest in a bow cutter, which stamps out the individual parts of the bow for you. JEM Cutters make an excellent selection and there are several other options online.